I recently came back from my grandmother’s funeral which was an unusual and extremely emotional experience. Not because I was close with her, in fact, I had never even met her, but because my grandmother, aunt and 5 cousins were killed during the Shoah 69 years ago and only recently was the mass grave that they were buried in discovered. So recently, my brother, my son and I traveled to Poland to attend a ceremony honoring the murdered Jews of the small village in Poland called Zdzhilovice. It was an experience I will never forget. My father grew up in Warsaw, the son of a clothing manufacturer. When the war broke out, his family ran to Zdzhilovice, about a half hour south of Lublin, where his father had once before sought refuge during World War One, and a place that they had a number of relatives. My father was asked to stay in Warsaw and finish up some business and then join his family in Zdzhilovice where they were hidden by a Polish family. As he attempted to leave, the Nazis closed the city and forced the Jews to build the walls of what was to become the infamous Warsaw Ghetto. After a few months, he managed to escape the Ghetto and join his family in Zdzhilovice, where he thought that he would be safer. But after only a few weeks there, on September 7, 1942, the sound of German trucks could be heard in the distance. His mother told him, his brother and father to run and hide in the forest and come back when things quieted down. After all, it was unfathomable that the Nazis would harm women and children. But that day, the unfathomable became reality as the Nazis with the help of some of the locals, gathered up all of the Jews they could find, 73 in all, shepherded them into a field, stripped them naked and machine gunned them to death. Upon returning the next day, my father found out that all of the remaining Jews of Zdzhilovice were killed and tossed into a mass grave. When I heard the story, I couldn’t sleep thinking about what my father, grandfather and uncle must have felt like when they returned the next day to find out that their mother/wife and daughter had been killed. But most of all, I thought about my poor grandmother and the others being forced down the hill and stripped of their possessions and their dignity before being mercilessly killed. 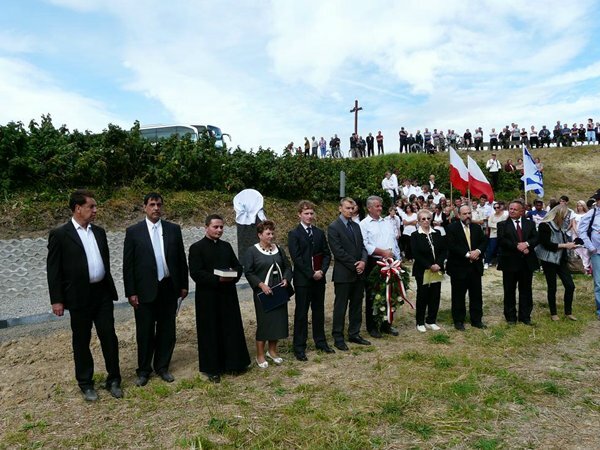 The location of the grave was unknown until 3 month ago when a Polish, righteous gentile, Zbigniew Nizinski,, who started The Lasting Memory Foundation 3 years ago to locate Jewish graves, notified Yad Vashem, that the infamous mass grave of Zdzhilovice had been found with the help of old eye-witnesses who had finally come forward. Upon researching the files, a representative of Yad Vashem notified another survivor of Zdzhilovice, Tziporah Miller of Tel Aviv, a spry 85 year old woman who lost both of her parents and many relatives in that village. It was she, who my father had known during the war and was reunited with 30 years ago, who called my father and told him the news. Unfortunately, my father, now 88, didn’t feel up to making the trip so my brother, son and I set out to pay respects to our lost relatives. We met up with Mrs. Miller and her group of 8 family members and they arranged for a group of Israeli high schoolers from Modiin, who came for the March of the Living, to be at our ceremony as well. Mrs. Miller served as our guide and told us as well as the Israeli students about her harrowing story of survival. My father spent the rest of the war in the Russian Partisans where he was able to fight for his survival despite being wounded twice in the process. He and his brothers survived the war but their father never made it out Zdzhilovice. He died as the Nazis burned the farm house he was hiding in as they retreated. My father eventually came to America and began a new life. He became a successful businessman and was a member of the executive committee of WAGRO, the Warsaw Ghetto Resistance Organization for over 30 years. Although he was emboldened and emerged from the war a freedom fighter, the memories of the deaths and destruction and always running in the forest, never completely went away. When we left to go to Zdzhilovice, I didn’t know how I would feel. After all, this was a town that was notorious for collaborators and where my father says the church announced to the locals that they would get a bottle of vodka and a kilo of sugar if they turned in Jews. When we arrived at the site of the event, all of the townspeople were there to greet us, marching band and all. 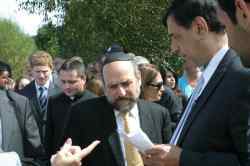 Mr Nizinski arrived shortly thereafter with Rabbi Schudrich, an American who is the Chief Rabbi of Poland, along with a representative of the Polish President. 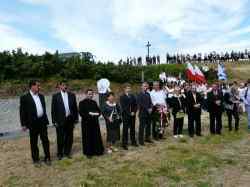 As we proceeded down the hill to the grave, we were accompanied by the local priest and town officials along with a contingent of Polish school children. Oddly enough, the older villagers stayed on the road and watched the proceedings from a distance. Mrs. Miller spoke in Polish and told about her hometown that had become a graveyard to so many of her friends and relatives. I spoke about how millions of Jews were killed during the war and recounted how on that dark day, this town so close to the great Yeshiva of Lublin, was the site of this terrible massacre. I pointed out that our presence along with the contingent of Israeli students were living proof that the Nazis had failed. I promised my grandmother that we will never forgot her or the other victims of Nazi tyranny. (My daughter Aliza is named after her). 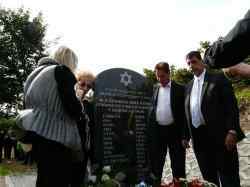 The most poignant moment came as the monument with the names of 26 of the 73 known victims inscribed (7 of who were family members) was unveiled and Rabbi Schudrich recited El Maale Rachamim inserting the names of the victims, while Mrs. Miller leaned on the stone and sobbed. After so many years, she was finally getting closure. Rabbi Schudrich then proceeded to recite Kaddish which was followed by readings by the local school children. The program concluded with Hatikvah led by the Israeli children from Modiin. 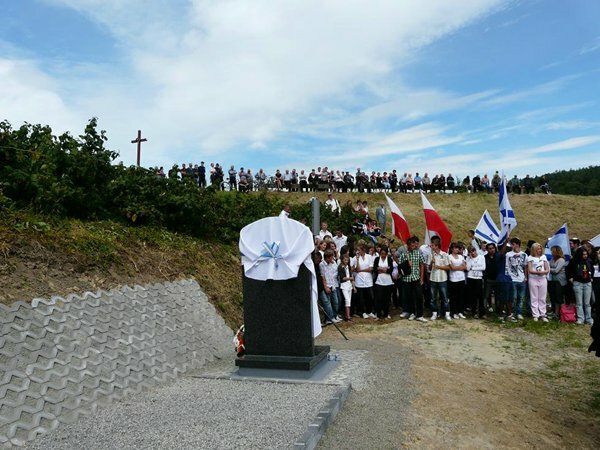 The sight of Israeli flags waving in the wind with hundreds witnessing a final farewell to the victims of the Zdzhilovice massacre was an incredible sight. It was a privilege meeting Mr Nizinski and Rabbi Schudrich who have managed to preserve 10 mass graves and have plans to do an additional 30, when they can get funding. I was enlightened to see young Polish children decry the horrors of the holocaust and realized that there are 2nd, 3rd and 4th generation Poles who are sympathetic to the plight of the Jews as were those select few Poles who hid Jews in their homes and farm houses during the war. My father passed away a few weeks ago and we feel fortunate that he was able to live long enough to get closure on the location of his mother and sisters burial place. It made him so happy to know that there was finally a monument with their names on it and that they finally had a proper funeral. For that we have Mr Nizinski and Rabbi Schudrich to thank. The Jewish Community of Poland is a shadow of what it once was with the largest concentration (about 5000) living in Warsaw. There Rabbi Schudrich and his associates reach out to bring Jews, many of whose parents and grandparents were raised Christian to escape the Nazis, back to their heritage. As we closed a chapter of the atrocities of 69 years ago, a new chapter is being written to restore some of what was once one of the most vibrant Jewish communities in the world.